We have been working with Never Summer Industries for a long time. We love their values and attention to detail. 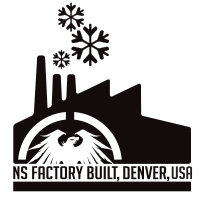 The NS factory in Denver, CO puts all its resources into making the best snowboards they can and backing their craftsmanship up with the best warranty in the business. We much prefer this to spending half the budget on hype to sell a lesser product. As well as their own Never Summer Snowboards, the NS factory also produces boards for Academy Snowboards and SIMS Snowboards. We also distribute these brands as we know the product coming out of NS will be good. Different brands offer different camber profiles and brand stories. SIMS is one of the original snowboard brands that has been around since the beginning of the sport. Academy have been around since 2002, and over the years have shown their dedication to snowboarding.